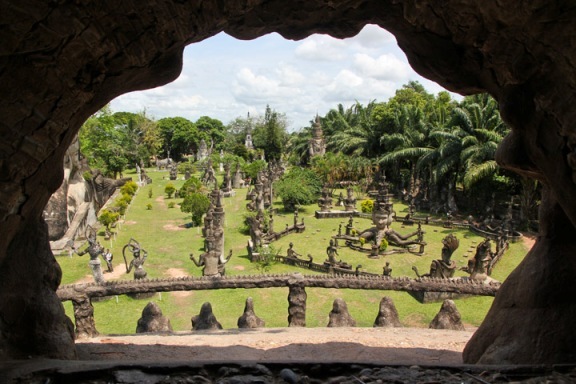 Buddha Park, a concrete testament to the obsession of Luang Pu, a shamanist priest who conceived and started building the park in the 1950s, is a fanciful sculpture garden full of Hindu and Buddhist statues. The statues are captivating, whether they are snarling, reposing, saving maidens in distress or carrying them to their doom. The huge reclining Buddha is outstanding; you can climb on its arm for a photo. There is also a large pumpkin-esque dome to climb, itself filled with sculptures. The dusty and bumpy bus ride here provides clear views of Thailand across the Mekong. Built by King Setthathirat in 1565, Phra Keo was constructed to house an emerald Buddha that the king took from Thailand (which the Thais took back in 1779). 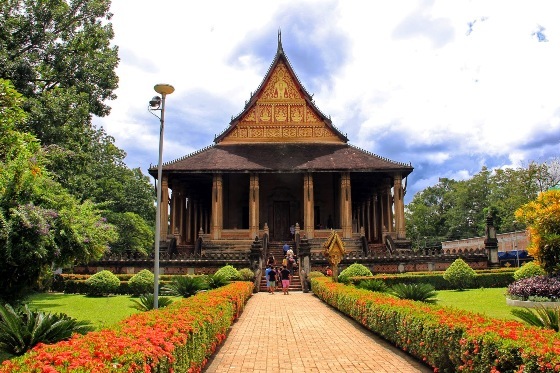 Today there are no monks in residence, and it is actually a museum of religious art, including a Khmer stone Buddha and a wooden copy of the famous Luang Prabang Buddha. In the garden, there's a transplanted jar from the Plain of Jars. 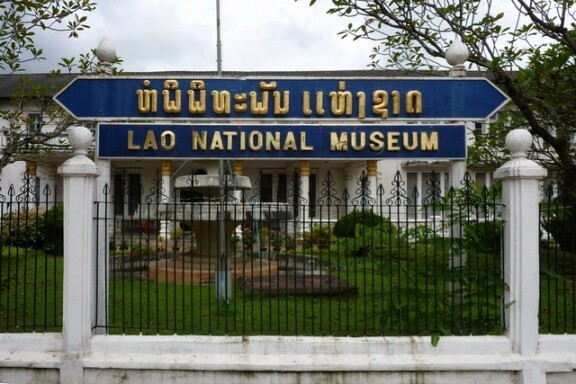 Housed in an interesting old colonial structure that was once used for government offices, the Museum of the Revolution has photos, artifacts, and re-creations of the Lao struggle for independence against the French and Americans. The exhibits are rather scanty, barely scratching the surface of such a complicated subject, but most are in English. Archaeological findings and maps presented on the first floor help make a visit here worthwhile. One of the most interesting exhibits is in the last room before you exit, sort of a Laos trade and commodities exhibit of produce, handiwork, and manufactured goods. 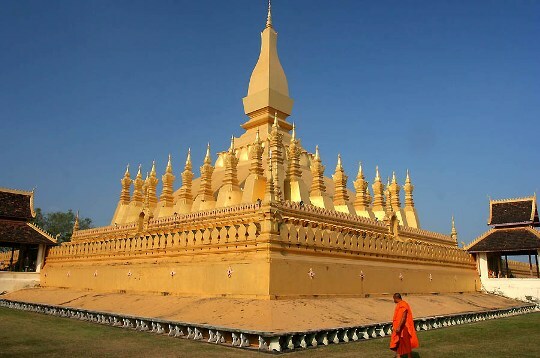 Though dated, it will give you some idea of Laos's geography and commerce. Completed in 1968 and dedicated to those who fought in the war of independence against the French, the monument is an arch modeled on the Parisian Arc de Triomphe. Its detailing is typically Lao, however, with many kinnari figures (half woman, half bird). It's an imposing sight, and you can climb up for a good city view. Once on top, numerous signs forbid the use of cameras, but no one seems to take heed. This is the town's main teenage strutting ground and is crowded on weekends. This ancient stupa was probably constructed in the 15th century or even earlier, though it has never been dated. 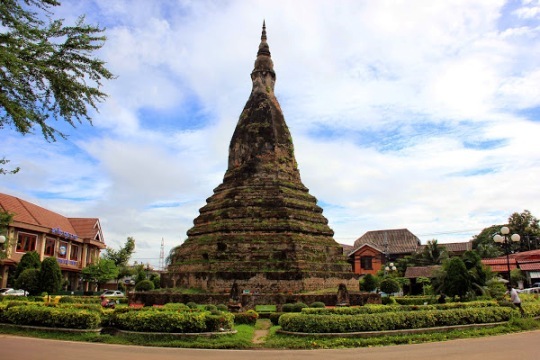 It is rumored to be the resting place of a mighty seven-headed naga, or dragon that protected the local residents during the Thai invasion in the early 1800s.